Ferrous and Non-Ferrous Materials – 3D Master Cam Programming guarantees optimal material usage. Each of the 6 work centers in the Mill Room are laid out specifically to provide efficient flow through with dedicated sawing and finishing equipment in each cell. Our GR510 features a 60” X 120” travel, and 4th axis machining. 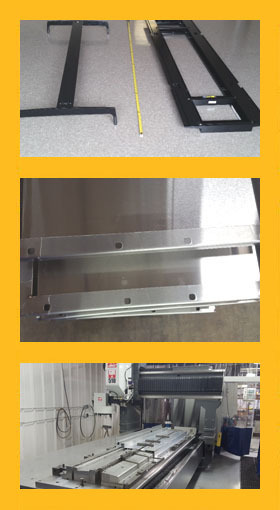 Our panel folder has dramatically reduced set up costs and tightened tolerances for our sheet metal customers. CNC programmable back gaging and a rotating forming beam with segmented tooling allow for box forming and single piece flow through the machine.